Can a building shrug off its winter coat for a summer dress? A Prouts Neck home, built in 1999 for a Chicago-based couple, seems to have done just that. A recent redecoration replaced a palette of beige, reds, and greens with neutrals and pale blues and greens. Carpeting and drapes were removed, furniture reupholstered, and the kitchen gutted and redone. The changes made for a sleeker sensibility. Think of a traditional Maine cottage that decides it wants to wear a sophisticated frock for a change. And in a larger size, given that the redo involved an expansion for better dining and gathering options. The Chicago couple are carrying on a tradition of summers in Maine that started with the husband’s childhood visits to grandparents. The husband’s parents met on Prouts Neck. Two of his siblings and his late brother’s wife now also own homes there, so parties for the extended family can draw over 30. “Someone will say, ‘I have a houseguest coming in,’ or ‘Can I bring so-and-so?’ and you can hardly say no,” says the wife. 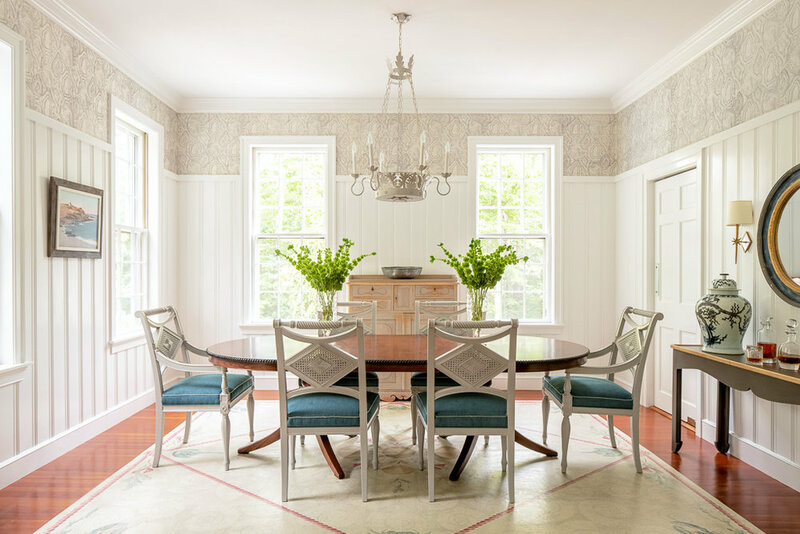 Interior designer Leandra Fremont-Smith of Yarmouth, Portland’s Wright-Ryan Construction, and the original architect, Cambridge, Massachusetts–based Ken Bolton, are responsible for the renovation and addition. The most striking change is the second-floor kitchen and attached deck with its catwalk to a new structure: garage below, screened porch above. The porch reads as a living room with a stone veneer chimney with raised bluestone hearth, built-in cabinets, and wicker furniture with navy cushions. Yet, as Wright-Ryan project manager Patrick Verville notes, the space is open to the elements. White storage benches sit under windows that ring the room. Wheels allow the benches to be easily reconfigured. Although the dining and living spaces might be considered transitional, the new kitchen, designed by Conrad Arseneau of Kitchen Cove Cabinetry & Design in Portland, with Smith’s assistance, is sleekly contemporary with traditional and industrial touches. Inspired partially by the homeowners’ kitchen in Chicago, the room doubles up on prep spaces and makes the flow through the space more natural. Flat-panel walnut cabinetry is painted either linen white or flatiron gray. Silestone (in Calacatta Gold) was used for the countertops and island, as well as a stove backsplash that slides open for spices. In the space that the addition provided, a faux leather banquette wraps a French cafe–inspired table and chairs. A stainless steel strip serves as trim for the more traditional white stove hood and for the island’s electrical outlet port. The floor is a herringbone porcelain tile. All these cool colors made the designers want to warm the space by picking brushed brass for the pendant lights, cabinet handles, and stainless steel strip detailing. The kitchen’s adjoining pantry is an eye-popping aqua, a burst of color otherwise replicated (in a slightly different shade) only on the front hall’s ceiling. Working with the existing rug and furniture, Fremont-Smith also freshened the dining room with new sconces, new paint for the chandelier and chair frames, a peacock twill for the dining room chairs, and a Manila hemp Phillip Jeffries wallpaper for a high border over the (freshly painted white) paneling.